To create a Buy 1 Get 1 Offer, follow the steps below. Step1. Choose a product to upsell. In this example, we choose Awesome Sneakers. Then, click Next. Step2. Set the discounted value. 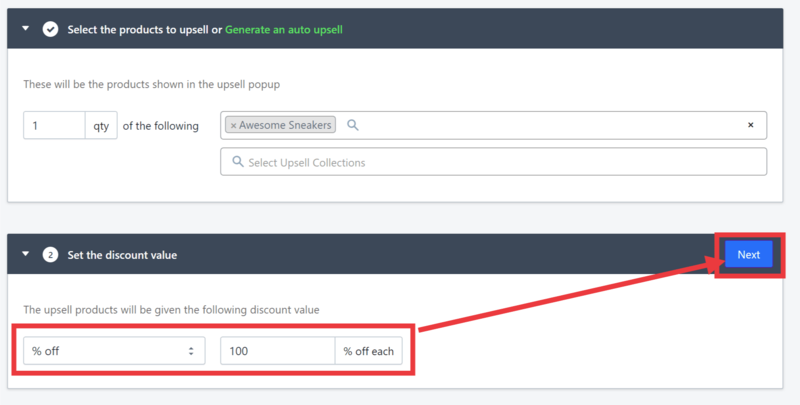 Choose the type of discount for the product and the amount by clicking the drop-down menu. In this case, we are setting it to 100% to achieve the Buy 1 get 1 offer. Then, click Next. Step3. Select the triggering product then click Done. In this example, we choose Cool Kicks.